We know planning life with kids can be a challenge. That's why we've partnered with WeJoySing to host cost effective drop in music classes at the shop! For $5 a child, and $3 for a sibling; you and your little love can learn to love and appreciate music! 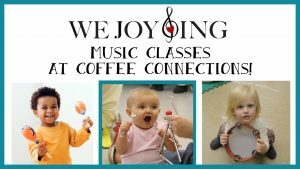 To secure your spot in class, email wejoysing@wejoysing.com or call 614-868-0107. Whether your pre-register or just come the day of class, we know you and your little one will have a joyous time! Infant siblings are not charged; but if an older or younger sibling attend the class it is $3 for that child. Once a month our shop transforms it's aroma from coffee to fresh baked delicious-ness. 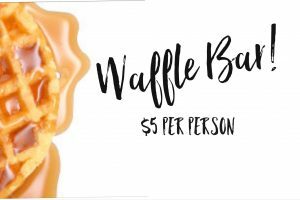 For $5 you'll get one Belgium Waffle with unlimited toppings. It includes either a drip coffee or a juice; for just $3 you can upgrade to a large latte! Parenting is SO REWARDING. And exhausting. Enjoying a hot cup of coffee and adult conversation is A MUST to keep your sanity. 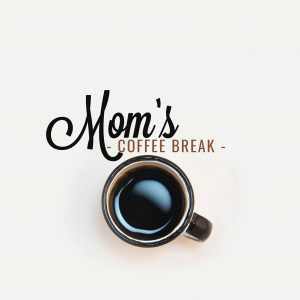 Join us for a coffee break! It's from 10-11; there's a puppet show for the littles and sanity for the mom's! Cori's Confection's will also have set up a cookie decorating table for just $1.50 per cookie- all the fun of cookie decorating WITHOUT the mess at home! Bring a friend or come and make a new one. Want more? Check out our Facebook Page!